They don't call complex situations "byzantine" for nothing. Constantinople and the last Caesars bring you new gameplay options and decisions. You can't have a crusade with only one side. 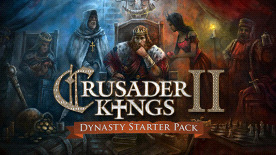 Play any of the sheikhs and caliphs that contest control of the Holy City, with new religious and political mechanics. Travel back in time to the days of Viking longboats and pagan dominance in the Baltic. How long can you resist the pull of Christianity? Raiding, looting and adventuring.